I have been awarded France’s Grand Prize for Urbanism. Within an atmosphere of doom is opposed an ingenuous optimism. Numerous French cities have adopted territorial visions and projects. These projects seek to anticipate the future, and in surpassing all administrative boundaries often meet up with the boundaries of the surrounding natural geography. There is much discussion at present of the “Greater Paris effect”, but it is much more than just fashionable talk. Following a significant lack of projects, there come broad expectations and preparations over long periods of time. All this takes place as if it has been the lack of economic foresight and presence that has moved us away from the production of the iconic to that of the territorial, collective, and sustainable. But the object of our desire to build has itself been transformed, moving away from the spectacular (for example, the famous building in Eric Rohmer’s movie The Tree, the Mayor and the Multimedia Library), towards that of more modest prototypes of territorial projects. These smaller but delightful constructions appear to me with equal optimism as a kind of prefiguration, prerequisites for the vast transformations to come. These prerequisites for the future, oftentimes considered temporary, often constructed during the urgency of approaching elections, are conceived of with a kind of detachment. Paradoxically, these uncertain conditions end up giving shape to architecture that lasts, for within this modest environment detached from any notion of heritage, all kinds of transformations become possible. And it is these transformations that have the potential to last. I have discovered that when awarded a grand prize for urbanism, one is inevitably asked to define one’s vision of the ideal city. I do not design a city but rather believe in the power of recomposing our urban territories within their geography. I believe in the construction of those public spaces lacking within the scale of the last century’s large urban sprawl. My ideal city is not a model. My ideal city is any city at all to which an edge is drawn. Nowadays, the thin line fencing off the dizzying amount of urban development, encircling the housing projects and industrial parks, is a formidable reservoir from which a public space can be invented. I like the idea of these transformations just as I fear of contributing to a new academism of complexity. A vast and complex bricolage where everything retains its logical sense without ever imparting a sense of “grandeur”. Adriaan Geuze invited me to the International Architecture Biennale in Rotterdam expecting me to deliver this “French grandeur”. My project was a recomposing of the estuary, the islands, and the developed riverbanks. 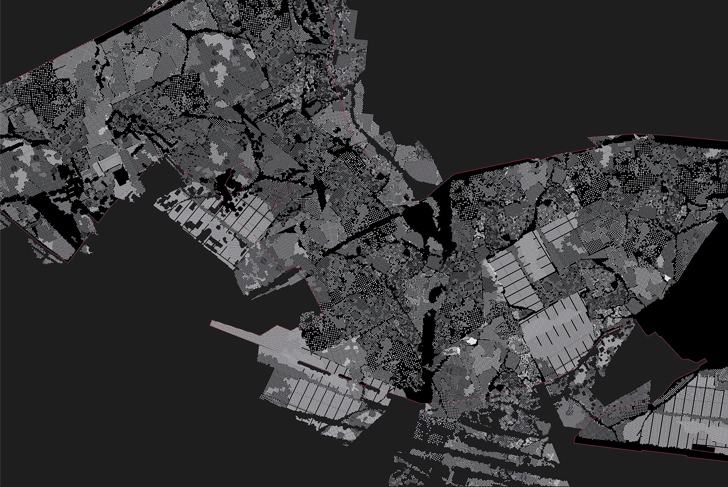 A geography in reverse, the expansion of Rotterdam to the scale of a delta and its floods. My version of French grandeur of which Geuze and I have not spoken about again since. In Skolkovo in Russia, in Doha in Qatar, one fears not a certain amount of grandeur. These cities present perfect opportunities for the exportation of veritable ideal cities. But a curious schizophrenia would develop between the theorized paralysis reigning here and the widespread commercial cynicism over there. There is just one world and certainly no double life. In Skolkovo as in Doha, I “invent” small valleys, I accentuate the relief of the landscape, I render the summits serviceable. Fighting against the snow in one place while symmetrically working to capture the smallest drop of humidity in the other, sometimes determining the implementation and form of these cities under construction. Futile explorations when faced with the endless exportations of other ideal cities? Certainly not, and to be convinced of this, Luigi Snozzi’s Monte Carasso should be visited again and again.